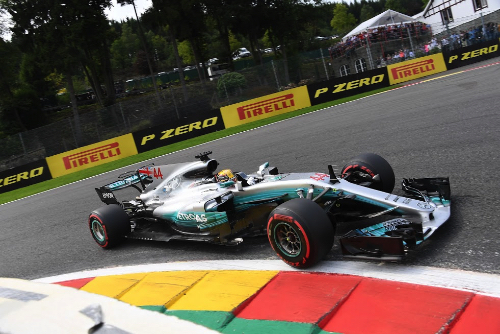 Lewis Hamilton won the Belgian Grand Prix, at Spa-Francorchamps today in his Mercedes GP, followed closely by Sebastian Vettel in his Ferrari in second place 2.3 seconds behind the winner. Daniel Ricciardo finished third in his Red Bull, 10.7 seconds behind. It is Hamilton's 200th GP start, his fifth win of the 2017 season and 58th career win. Hamilton has closed the gap to just 7 points behind Vettel in the Drivers Championship. Kimi Raikkonen (14.471s) in the Ferrari was fourth, followed by Bottas (16.4s), in the Mercedes was fifth, Nico Hulkenberg (28.0s) in the Renault was sixth, Romain Grosjean (31.5s) in the Haas was seventh, Felipe Massa (36.6s) in the Williams-Mercedes was eighth, Esteban Ocon (38.1s) in the Force India-Mercedes came back to finish ninth and Carlos Sainz (39.4s) in the Toro Rosso-Renault finished in the final points scoring postion in tenth. Before the start the top starters were on ultrasoft tyres, with Stroll in 15th on super soft tyres as well as those behind him. The grid clears and the drivers take the formation lap - the lights go out and the race begins with the run to the La Source hairpin with Hamilton taking the lead from Vettel and Bpttas. Vettel going side-by-side up the hill, Alonso is up to seventh place. Hulkenberg passes Alonso for seventh at the chicance. At the end of the first lap Hamilton leads Vettel, Bottas, Raikkonen, Verstappen, Ricciardo, Hulkenberg, Alonso, Ocon, and Magnussen in tenth. Alonso repasses Hulkenberg up hill. On lap 3 Hulkenberg comes back and repasses Alonso for seventh. Wehrlein pulls into the pits with a damaged suspension. On lap 4 Ocon passes Alonso for eighth place. Magnussen passes Grosjean for 11rg.Hamilton leads Vettel by 1.7 seconds. Perez passes Alonso for ninth, Alonso tells the team, "embarrssing, reallly embarrassing". Grosjean then passes Alonso for tenth place, the Spanaird losing ground after a good start. On lap 8 Max Verstappen slows and pulls off the track with a mechanical failure. Bottas complains to the team that his front left tyre is blistering. Vettel sets fast lap at 1m49.911s. At lap 10 Hamilton leads Vettel by 1.9 seconds, followed by Bottas (7.9s), Raikkonen (11.4s), Ricciardo (17.8s), Hulkenberg (26.7s), Perez (34.4s), Sainz (44.8s), Kvyat (49.1s) and Ocon in tenth place. Hulkenberg pits for soft tyres. On lap 12 Hamilton pits from the lead and switches to soft tyres and rejoins in fourth. Ocon passes Kvyat for eighth. On lap 14 Bottas pits from second for soft tyres and rejoins behind Ricciardo in fifth. On lap 15 Perez passes Kvyat and Grojean up the hill for ninth. On lap 15 Vettel pits from the lead for soft tyres and rejoins just ahead of Hamilton - Hamilton drag races the Ferrari out of Eau Rouge and takes the lead again. Raikkonen pits for soft tyres. On lap 16 Bottas sets fast lap. Ocon passes Sainz for seventh place. Vettel is lapping with Hamilton and is only one second behind the leader. Raikkonen is handed a 10-second stop-go penalty for when Verstappen was stopped on the side of the track. Raikkonen pits and serves his stop-go penalty. Perez is handed a 5 second stop-go penalty for cutting the track after passing Grosjean. Sainz pits. Raikkonen passes Ocon for sixth place. At lap 20 Hamilton continues to lead Vettel by 1.3 seconds, followed by Bottas (7.3s). Ricciardo (21.8s), Hulkenberg (42.9s), Raikkonen (47.3s), Ocon (50.1s), Perez (51.1s), Grosjean (58.4s) and Magnussen (63.6s) in tenth. On lap 23 Bottas sets fast lap at 1m48.616s. On lap 25 Ericsson pits for a second time for more soft tyres. Perez pits as well. Alonso pits and retires the McLaren with an engine problem. On lap 28 Ocon pits. Perez sets fast lap at 1m48.300s. Perez passes Ocon for tenth place. Ocon continues to battle Perez - Ocon loses his front wing touching Perez's rear tyre, the two Force India's limp back to the pits - the safety car is deployed. Raikkonen pits for ultra soft tyres. Hulkenberg pits as well. Hamilton pits for soft tyres, Vettel pits for ulta soft tyres, Bottas for soft, Ricciardo for ultra soft tyres. Others pit as well. Behind the safety car Hamilton leads Vettel, Bottas, Ricciardo, Raikkonen, Hulkenberg, Grosjean, Massa, Magnussen, Ocon in tenth, Sainz, Stroll, Kvyat, Perez, Palmer, Vandoorne and Ericsson. Hamilton says, "why have they got the safety car out this is ridiculous. There's literally no debris anywhere." Then says, "why is the safety car going so slow? I can't keep temperatures¦ I have glazed front brakes. On lap 34 the safety car comes in and the race resumes, Hamilton taking the lead and Vettel drafts the Mercedes through Eau Rouge, and just holds the lead. Bottas, Ricciardo and Raikkonen run three-wide and Ricciardo takes third over Raikkonen and Bottas. On lap 35 Hamilton sets fast lap at 1m46.603s. Hamilton leads Vettel by 1.3 seconds. Vettel is told by Ferrari that he can push his tyres until the end. At lap 40 Hamilton leads Vettel by 1.1 seconds, followed by Ricciardo (6.7s), Raikkonen (8.5s), Bottas (10.2s), Hulkenberg (18.7s), Grosjean (21.2s), Massa (25.1s), Ocon (26.7s) and Sainz (28.9s) in tenth place. On lap 41 Vettel sets fast lap at 1m46.577 seconds. Hamilton is told that tyre temps has stabilised and manage the tyres to his feeling, Hamilton tells his engineer, "just leave me to it". Palmer passes Perez for 13th place. At the finish Hamilton wins ahead of Vettel and Ricciardo.